Originally when Boku no Hero Academia The Movie: Futari no Hero came out last year, I did not go see it simply because only speciality theaters play anime movies. At the time I did not think the experience was worth almost $20 for a ticket, though I feel like my experience with Dragon Ball Super: Broly stated otherwise. 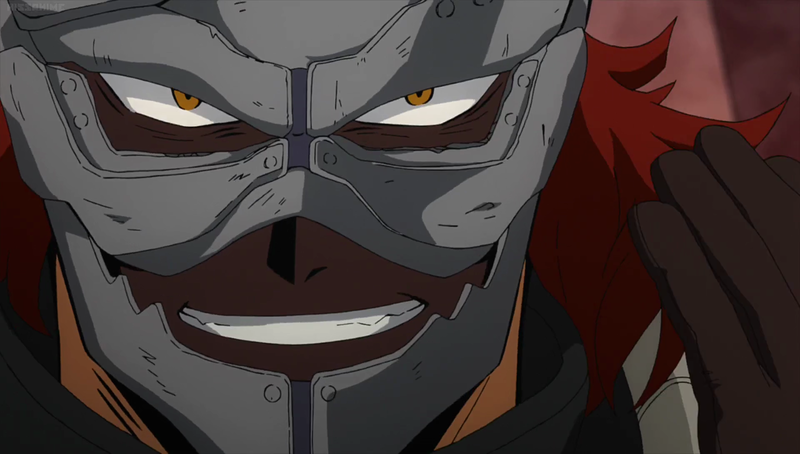 Now that it is 2019 and the Boku no Hero movie is available, I have finally been able to watch this movie and see what my friend Blanchard was boasting about after he was done watching it. All Might brings Midoriya to I-Island, a place where scientist live to study quirks regarding their applications, effects, and practical use. An upcoming expo is being held and this will give him time to catch up with an old friend, David Shield while also allowing our protagonist a chance to experience something outside of his home country of Japan. Things do not go as planned, and the high security island soon finds itself in need of saving; this is the basic plotline of Boku no Hero The Movie: Futari no Hero. The story of Boku no Hero The Movie is fairly simple, to the point, and that type of A-to-B transparency shines. An incredibly condensed plot with plenty of reasoning playing off of already established facts from the main anime allow the story to make a meaningful impact with the least amount of details possible. The setup at the beginning of the movie was rather slow, but I find that nothing felt like filler or out-of-place despite this, everything had an intent and a purpose. The backstory that elaborates on All Might’s relationship with David Shield, Melissa explaining her reasoning for wanting to follow her father, even how our favorite support characters managed to find themselves on I-Island. Boku no Hero The Movie: Futari no Hero takes all the necessary steps to elucidate different parts to shine a greater light when the whole takes center stage. Plot twists, motivations, and ambitions burst forward in a way that conflicts the viewer. Brilliant setup and execution allow for us to be immersed within the plot without a dull cloud of convolution, and even managed to make the predictable bits exciting by revealing information unbeknownst until that very moment. Those coming for something that is a complete package will be impressed by this aspect of it. 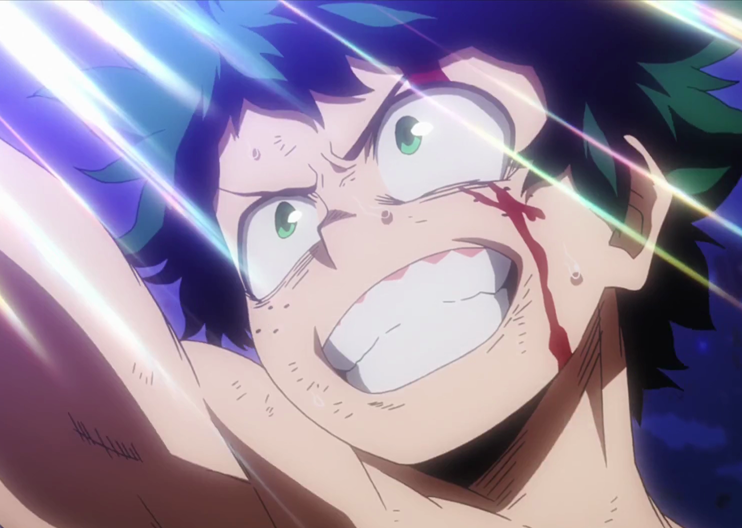 Characters within Boku no Hero The Movie did not try to reinvent the wheel, rather, they took time to make sure everyone they included was useful within their own way. Something I have always admired about the Boku no Hero series was keeping things grounded enough into the core of the show to logically make everyone useful. If you look at Dragon Ball Super, any reasoning for someone outside of Goku and Vegeta to make a reasonable impact has to be forced because of how lacking they made the support characters. I feel that Boku no Hero never loses sight on what is important and that attention to the entire roster makes for a better experience overall. 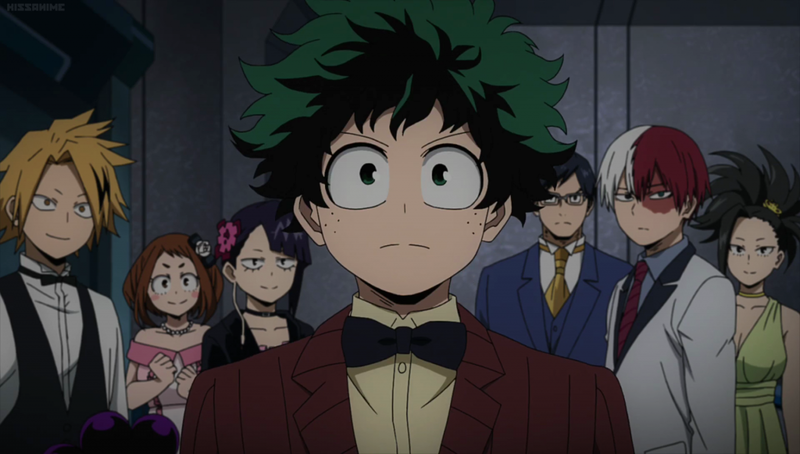 This being a movie, we knew that additional characters and new villains were going to be thrown into the mix with our tried-and-true cast of Boku no Hero. I feel those they added had their own motivations and reasons which fit well into the main plot of the story, this makes them seem more “real” and makes their contributions to the overall atmosphere one that is felt. David Shield and his daughter were given logical backstories, plenty of reasons to be there, and motivations of their own to push the story forward. I feel more anime need to take lessons from this movie in how they develop characters and what their intentions are. I like believable scenarios that make sense for everyone included, it creates a “complete” experience that everyone can enjoy because there is a reason for everything that is happening without it being forced or a pull. Characters will feel more relatable or allow for better empathy of the viewer when made properly. I will say, the only downside to the entire plot is how some of the characters managed to arrive to I-Island during the time of the expo everyone was attending. However, this is something relatively small and seems more-or-less like a gag that continued from how they presented everyone not to mention some of them made perfect sense to why they would be around (Bakugo, Lida, Midoriya, etc.). 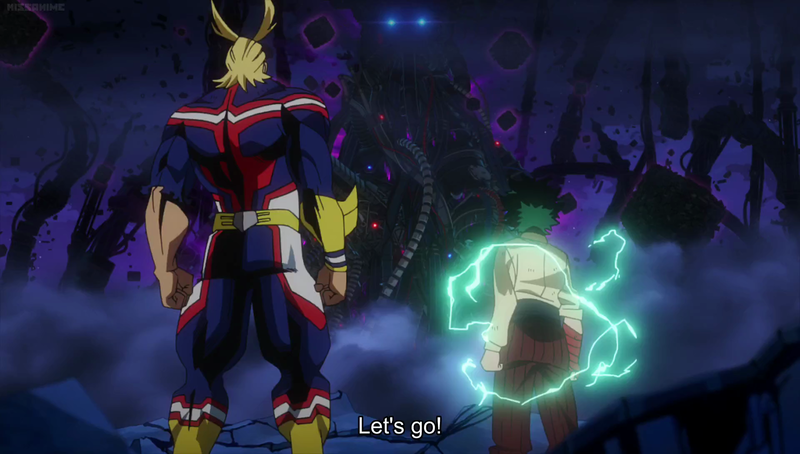 Something that is common in Boku no Hero is that action scenes are not pointless, they are part of the narrative and usually end up to finish off things as opposed to it being a constant that the anime itself is focused around. The theme I am referring to carries over into Futari no Hero. Something that should not be expected is over-the-top fight scenes throughout the movie, rathre, they will appear at key parts. You have a few cases of brilliant action-sequences in the movie, but most of the best fight animation occurs during the endgame portion of this anime. Despite what many people would think this means, it does not hurt Boku no Hero The Movie in the least. We have bits and pieces of great action scenes scattered throughout the movie in short bursts, but it will be to help push the story along more than just happening for the sake of fighting. So this movie is not incredibly action packed, but that has never been the case with Boku no Hero Academia. STRENGTHS — Great story, Relevance of existing support characters, Great action sequences, and Great introduction of new characters. WEAKNESSES — Beginning can be considered slow, Exact placement of movie within Season 3 has to be figured out. Boku no Hero Academia The Movie: Futari no Hero has proven how good story and pacing is when creating a memorable experience. This movie had the proper amount of build-up and elements which made all parts believable and logical; how to make it where All Might cannot act until it is needed, to make the villain someone worthy to fight, and how to incorporate all of the support characters in a logical fashion. Going in, I had no idea what to expect from this movie but left with a great feeling of hype and even more respect for the story and characters of Boku no Hero Academia. This movie fits well within the continuum of events of the main storyline by adding further depth and lore to the cast without being necessary for those who have only gotten a chance to watch the first 3 seasons of this anime. I strongly suggest this movie to anyone who is a fan of Boku no Hero Academia; it is well thought out, the actions scenes are amazing, and you will walk away with a genuine feel-good experience that will only increase your love for this series. Well done.